Most of my day-to-day riding is done sans passenger. 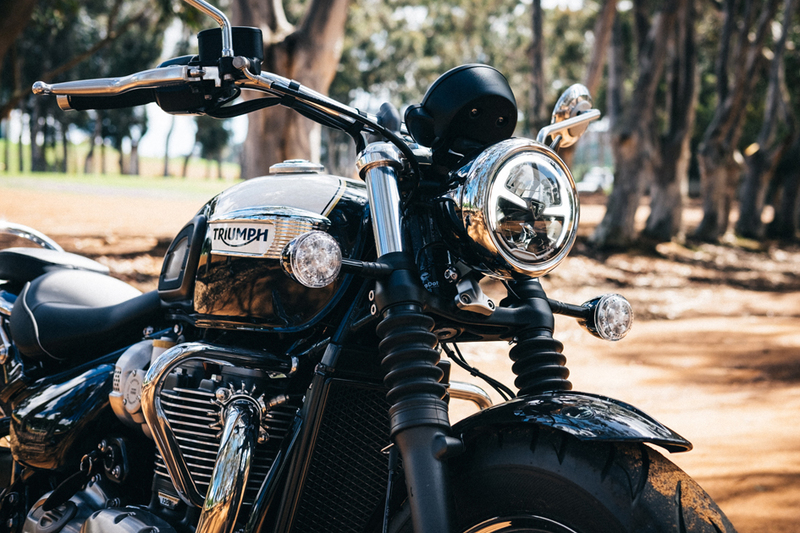 So when Triumph offered me a set of wheels for the Distinguished Gentleman’s Ride, the classy single-seated Bobber Black was a shoo-in. That is, until my significant other decided to tag along. 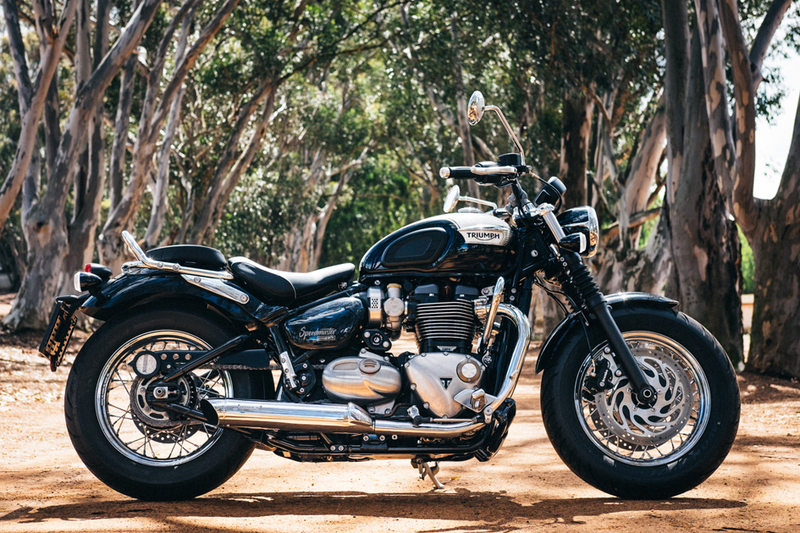 Switching strategies, I opted for the equally stylish 2018 Triumph Bonneville Speedmaster instead. 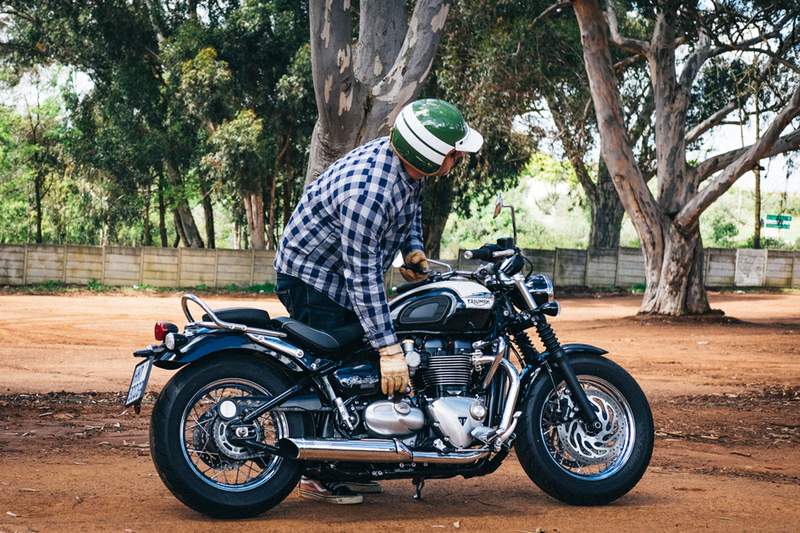 After all, the Speedmaster is just a Bobber with a passenger seat, right? Not quite. It’s true that they’re mostly the same bike under the hood. 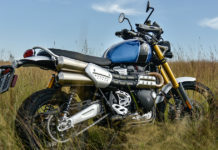 Both are powered by Triumph’s 1 200 cc ‘high torque’ parallel twin motor, making 76 hp, and a stonking 106 Nm of torque. 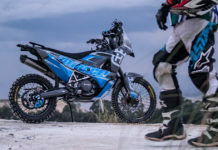 You also get a wet clutch, six speed box, and rider aids that include ABS, switchable traction control and two ride modes. 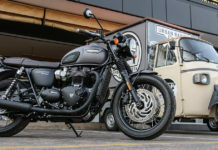 The Speedmaster and Bobber’s rolling chassis are virtually identical too. 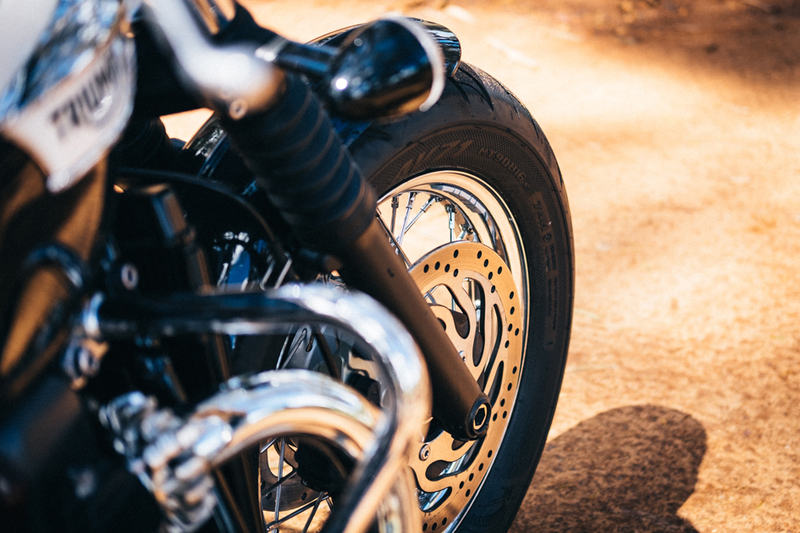 Up front, you’ll find the same 41 mm KYB forks as the Bobber, with the 16F/16R wheels from the Bobber Black. 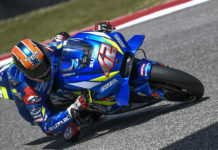 Braking is via twin 310 mm discs and a Brembo caliper up front, and a single 255 mm disc with a Nissin grabber at the back. 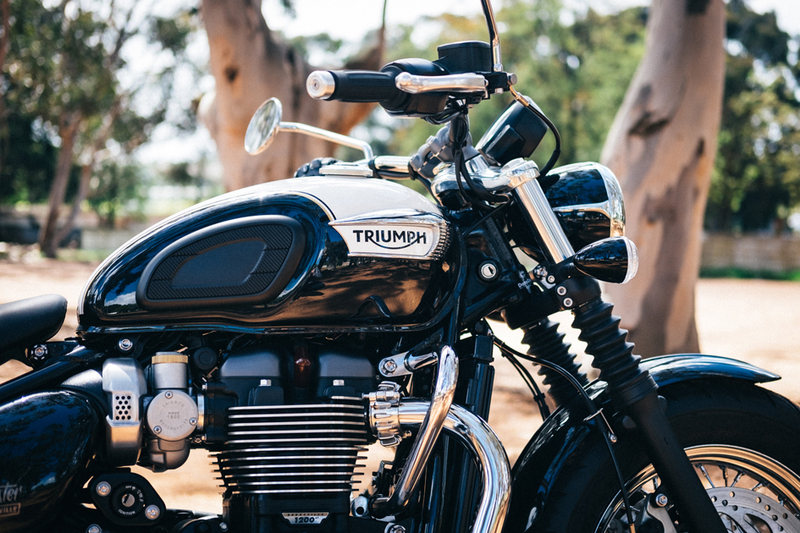 The rear end also features Triumph’s gorgeous faux hardtail design, with a KYB mono-shock tucked in under the seat. 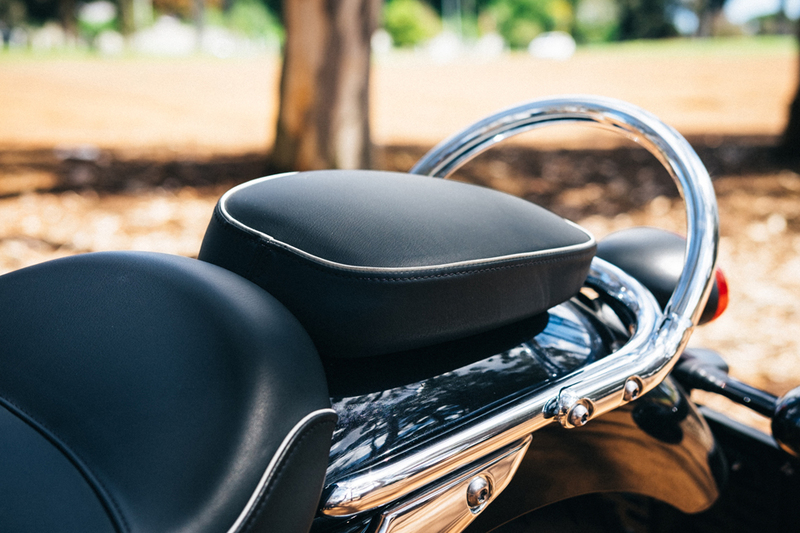 Except the Speedmaster’s seat doesn’t ‘float’ like the Bobber’s does. 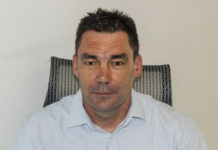 Triumph have added struts to the subframe, to support the rear fender, the back of the seat, and a small passenger pad. 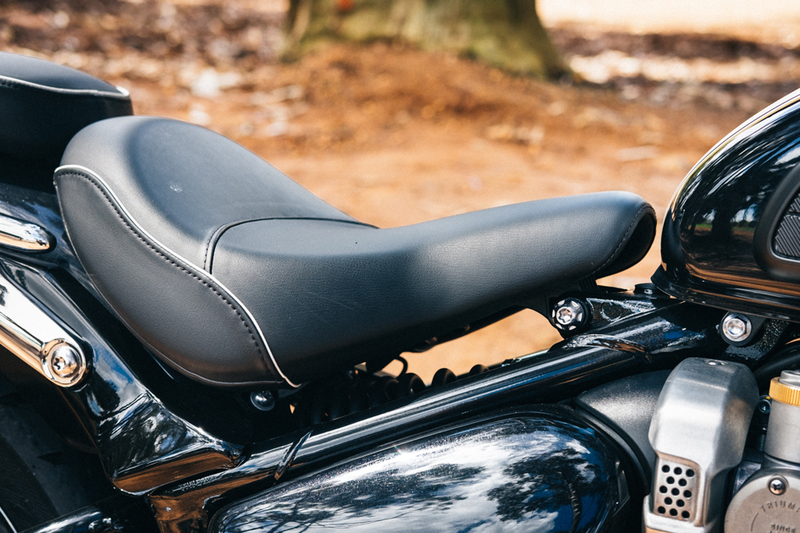 But that rear section’s not the only feature that sets the Speedmaster apart from its cousins. It’s also got a larger fuel tank, forward-mounted foot controls, and wide, swept-back handlebars. My test unit came in a sweet black and white colour scheme, punctuated by gold striping and finished with period correct tank badges. 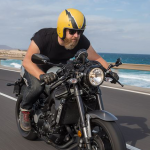 It also came with a few optional extras: softer grips, rubber knee pads on the tank, crash bars, and a pair of Vance & Hines cans. Every single finish—from the paint right down to the chrome trim on the headlight—was immaculate. The long-stemmed chrome mirrors look classic, but work well, while the LED daytime running light adds a modern edge. I’m a fan of the Speedmaster’s digital/analogue combo speedo too, which packs in all the important info in an easy-to-read layout. 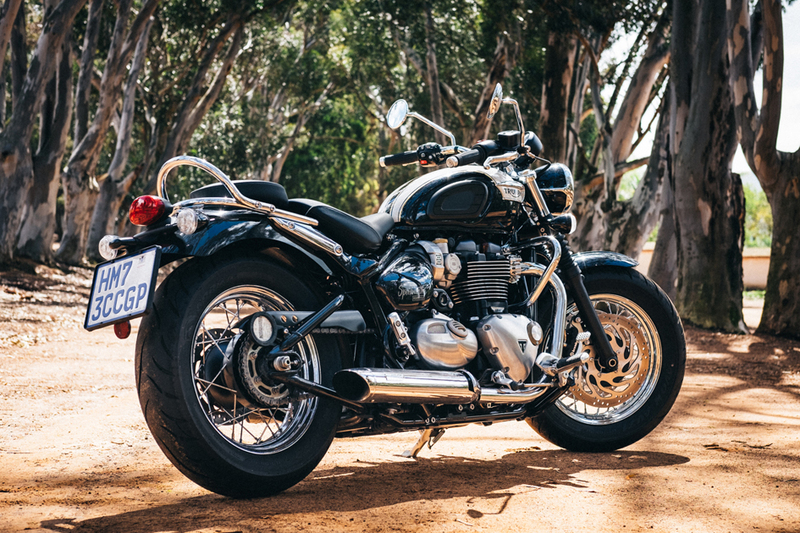 So while the Bobber packs a lot more attitude, the Speedmaster errs on the side of elegance. It’s fully British, fully cruiser and fully classy. 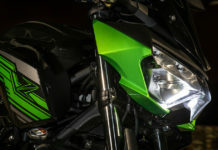 And it’s a real head-turner too, attracting admiration from riders and non-riders alike. Getting the Speedmaster out on the road surprised me though. 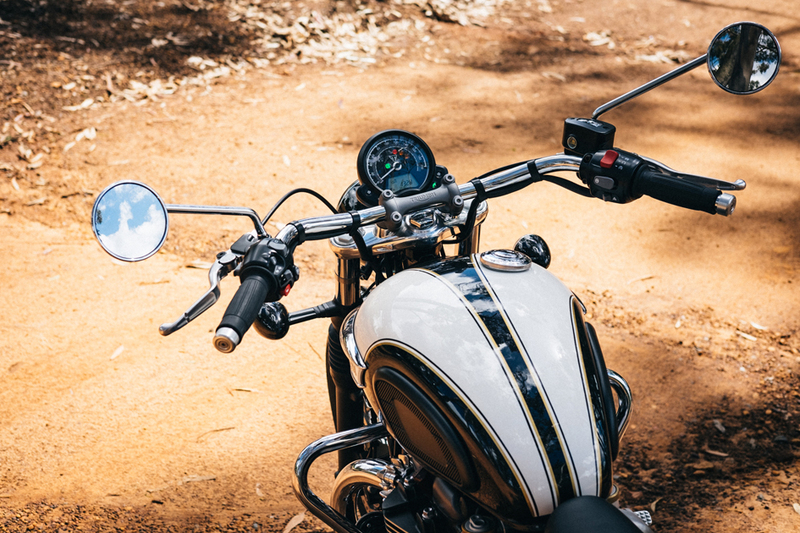 The laid-back riding position and classic looks suggest a relaxed ride—but the punchy parallel twin pulls hard, straight off the mark. 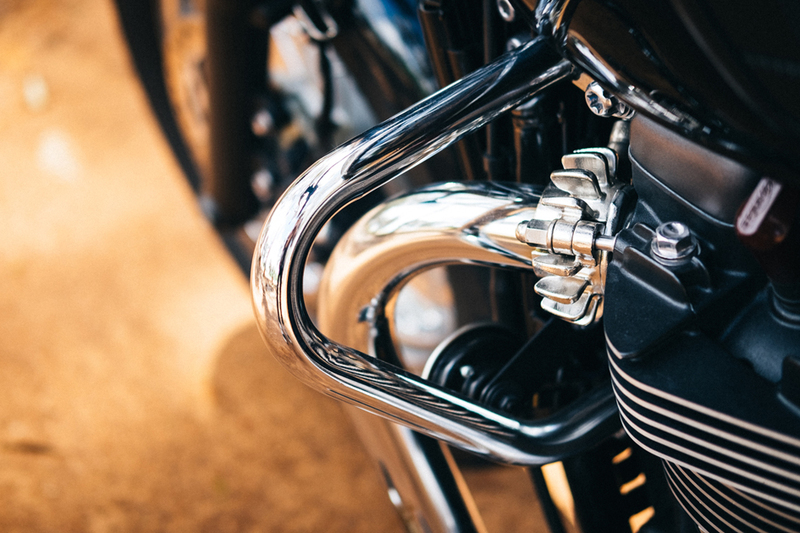 There are no hiccups in the fueling (or gearing), and power is usable all through the rev range. Braking is excellent too; the brakes are strong, but not grabby. 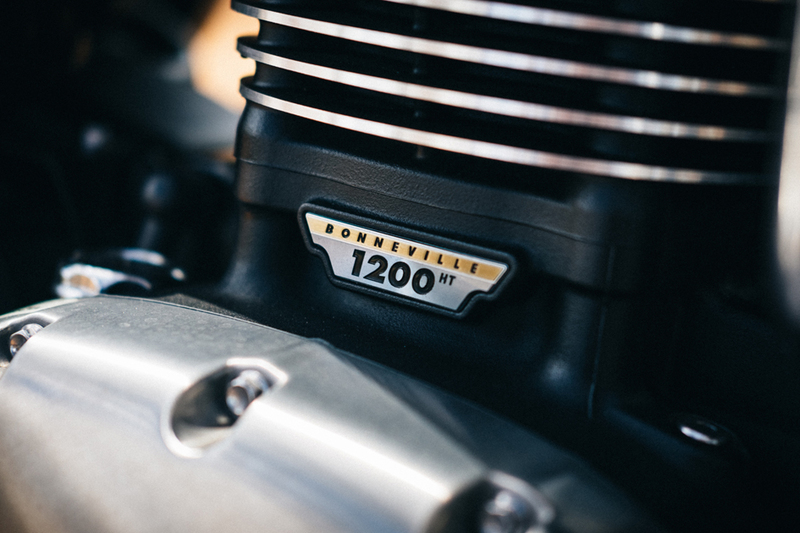 And the combination of the 270 degree crank and those Vance & Hines cans generates a raspy sound and feel. Switching between ‘Road’ and ‘Rain’ modes doesn’t make a huge difference, but it changes the power delivery enough to be a worthwhile feature. Deactivating traction control also hardly makes an impact—unless you execute a couple of hard downshifts. 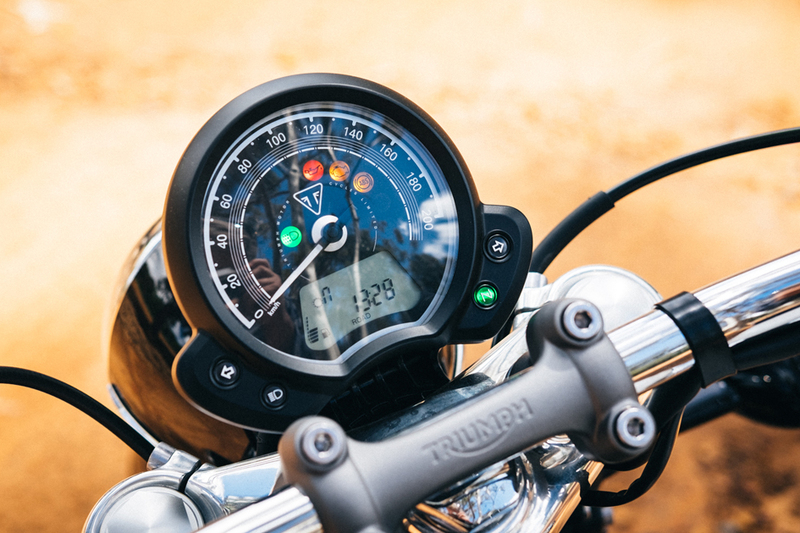 Triumph have also fitted cruise control to the Speedmaster, but it’s a rudimentary one-button system that’s more frustrating than it is useful. 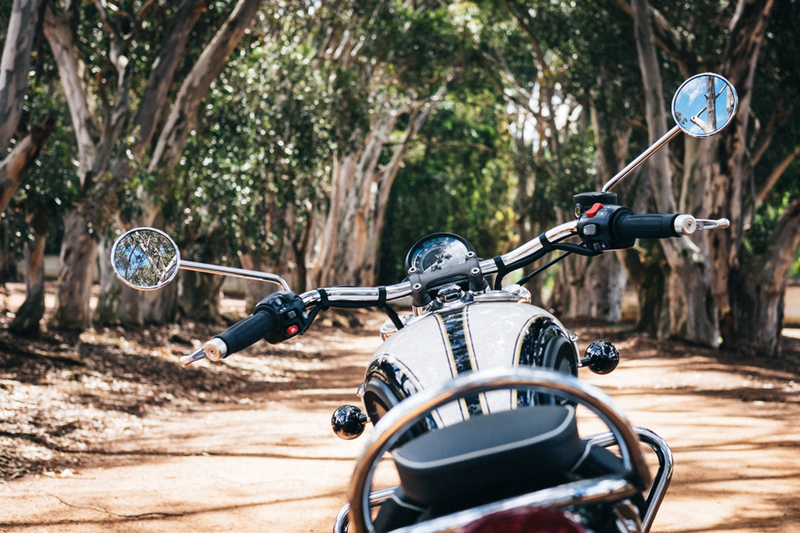 The Speedmaster also handles way better than any cruiser should, once you adapt your riding style. Those goofy handlebars felt a little awkward at first (like I was pushing a wheelbarrow), but I soon figured out how to make the setup work for me. 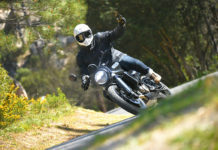 And once I did, the Speedmaster felt like it was cornering on rails. 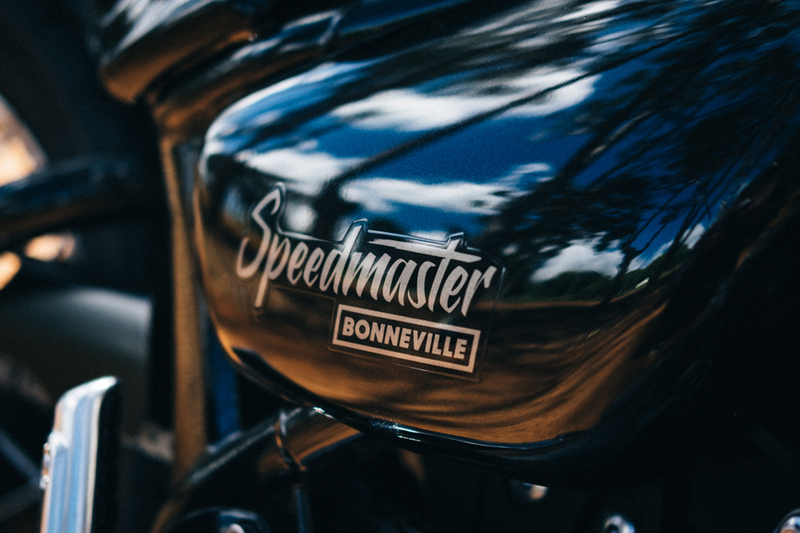 That mix of performance and an easygoing attitude make the Speedmaster enigmatic, in the best possible way. Never before have I ridden a motorcycle that both encouraged me to take it easy, and get rowdy, at the same time. 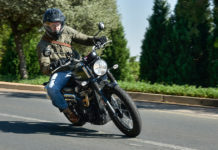 Luckily the Speedmaster has a lot more going for it than just a pillion seat. 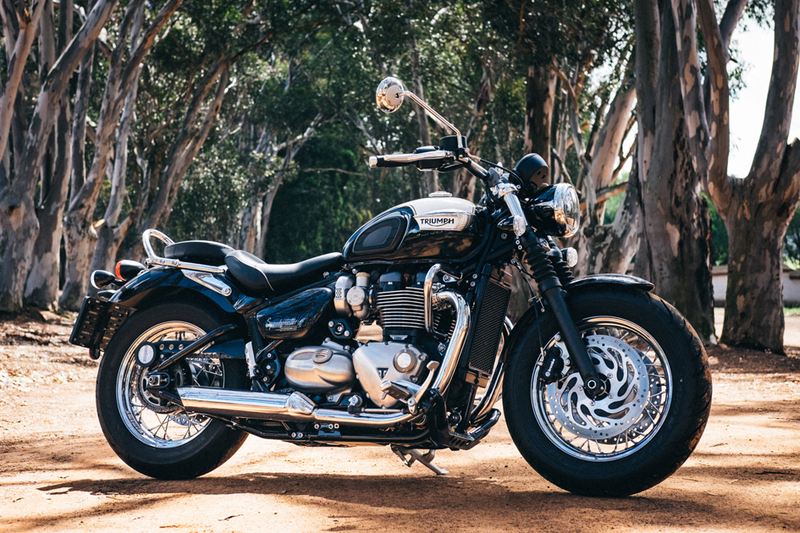 I’d take one anyway, ditch the rear pad for a small luggage rack, and continue my solo adventures… in supreme style.